There are several makers of cellphone holders for bicycles and motorcycles. We got one from Satechi, $30, because it was beautifully engineered and we couldn’t resist. 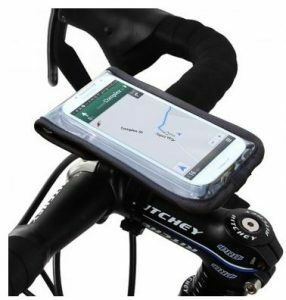 Now what is the point of attaching a cellphone to your handlebars? At first we had a wild image of hundreds of cyclists running into telephone poles as they tried to tap text messages on their phones. As a practical matter, you can’t text while you’re riding. You could conceivably talk to someone but the traffic noise around you would often make it near impossible. So what is the most likely use here? Directions! Joy is one of those people who gets lost easily – even when she’s going to places she’s been to several times before. Bob used to think this was pretty strange but has since learned that there are many people who seem to be “directionally challenged.” There are mild cases — like trying to find your car in a big parking lot, and serious cases – like not being able to find your way back to a building you left just a minute ago. Bob tried to help by buying Joy a compass but it turns out they work best if you’re a Boy Scout. But so far, a cell phone with GPS beats any compass ever made; Google Maps with their turn-by-turn directions is the way to travel. You needn’t look at the screen, because a friendly voice tells you when you go off track. When you get there, or stop for a sandwich, you can remove the pouch from its clamp and carry on. Joy found the turn-by-turn directions easy to hear and follow. This turned out to be necessary, because tapping through the tough plastic cover is, well, tough. She listened to music while pedaling, which unfortunately was still blasting away as she reached our apartment building; she couldn’t work the phone’s volume control through the plastic. A more costly way to go is the $120 “BikeCharge Dynamo” from Bike2Power. It lets you charge your phone as you peddle. (It takes two and a half hours at 12 miles per hour to fully charge a phone.) A basic phone holder, without the charging device, starts at $50. Bob, who cycled through Britain, feels he should point out that a device that generates power in this way does so by rubbing against a wheel to turn a tiny dynamo, and this takes noticeably more effort from the cyclist.